Greetings, Polyglots! So a lot of people have asked me about my language notebook and stuff. That makes sense right? All kinds of languageblrs and bloggers post at least six cubic tons of notebook inspiration photos a day because they should! But I have always been the kind of person to only passively enjoy notebook inspiration photos. Though the artfully designed and beautifully put together, I always thought it was too much trouble to buy special pens, highlighters, print photos and buy special paper just to make notes for study. It would always take too long for me because I’m not really an artsy person anyway. If you are able to do it, then I admire you! But I’ve never been able to dedicate time to decorating my notebook, let alone use neater penmanship! I’m too impatient. As I study, I want to focus on the language and not the notebook itself. So as a result, my notes seem a little messier than the ones I’ve seen on Pinterest, Tumblr and Instagram. My note taking works just fine for me, however, it is the reason I have been hesitant to share my notebook. 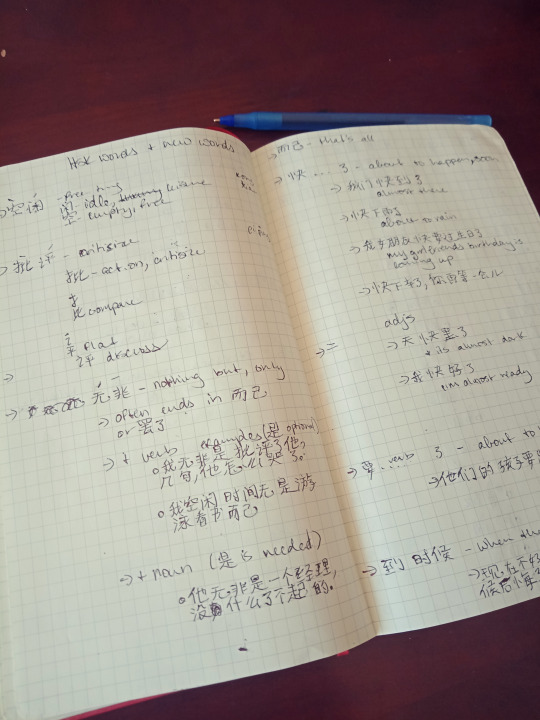 But without further ado, here is my not so pretty Chinese language notebook. How my notebook is organized is simple. My table of contents is in the front, my language learning goals after that and then all my vocabulary and grammar notes. Because I’m not using one single method of study, I am grabbing vocabulary from all different kinds of sources. The one in the photo above is from an HSK 6 vocabulary list for Chinese. 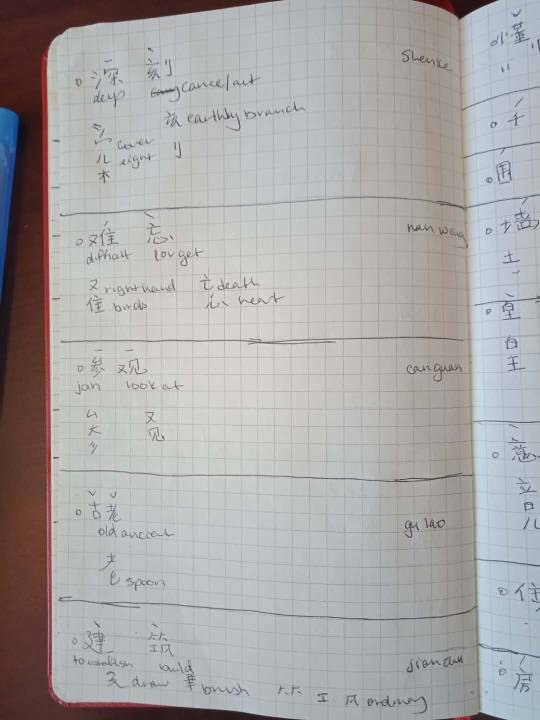 As you can see, I have listed the vocabulary word on the left side of the page, then the English definition and then the pinyin way on the right side of the page. I do this so it is not the first thing I see on the page when studying my vocabulary. Also notice that the tone is over the character and NOT in the pinyin. I do this to really remove dependence on the pinyin. I only look at the pinyin if I’ve truly forgotten how to pronounce the word. Then below the character, I have defined each individual character in case I encounter the character again. Below that I’ve taken apart some of the character radicals and defined them to help me remember the characters. I do not do this for the ones I already know. That’s it! Notice that I use no highlighters, special pens, special paper or cute handwriting. If you would like to incorporate some color into your language notes, that is up to you! But if you’re like me and would prefer to keep things super simple, I don’t think there’s anything wrong with that! In another post, I will share my not so pretty Korean and Japanese notebooks as well! Do you think it’s a worthy investment to decorate up your language notebook?